One thing that most traders are never able to successfully trade is commodities. The reasons for this can be broken down into two main categories: a lack of understanding, and a lack of sufficient capital. However, commodities can be some of the easiest assets to trade, so a lack of understanding shouldn’t be what keeps you from making money here. A lack of cash can be a hindrance, but binary options give traders an opportunity to take advantage of this sector of the market with little money. Where it might take tens of thousands of dollars to trade barrels of oil with a profit, you can do the same with binaries with just a few hundred dollars. The benefits of each need to be weighed against what your goals are. The big advantage of binaries is that they allow you to take advantage of the little changes that will occur from day to day. For those that pay attention to the news, this is a huge advantage, especially in a big asset like oil. The price of crude oil is often dependent upon what major nations are doing, and these activities are always at the forefront of the news. For example, when Russia is struggling economically, there is often a tie to oil exports because Russia produces so much of the “black gold.“ However, when you trade commodity futures, these little blips on the screen have often come and gone by the time you can do anything with your trades. In other words, the only reliable way to make money with commodities is over a long term, and binary options present you a short term alternative to this. You may have noticed that prices are going up at the pump again. 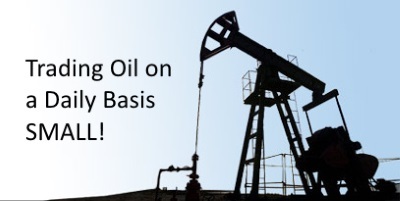 The reason for this is that oil has risen up to over $60 per barrel recently. The problem with trying to trade these over the commodity exchange proper is that it’s extremely costly. It is possible to have a short term approach, but if oil goes from $60 to $61–which is a big change for one day–then you would have to have at least 100 barrels to make the trade worthwhile to overcome the cost of contract and trade fees. And even then, you’re profit might not even be close to the amount of risk that you took. If you approach it with a binary options broker, then you can risk much less, and easily overcome the risk factors by only fronting $10 to $25 at a time. It might seem like a nickel and dime approach, but with the combined advantage of short term news reports and big rates of return for correct predictions, you can string those nickels and dimes into dollars quickly. In fact, many people use this approach to jumpstart a career as a commodity trader by learning the ropes in real time with little risk. Analysts are currently at a crossroads for what they think oil will do next. Some think that there is a sure decline back to where prices where a couple months ago, while others see the recent bull market as something that will continue. Risking $10,000 plus on an uncertainty is not smart, especially when you can risk a couple hundred on binaries and have a better chance of turning a profit with shorter term trades that are timed to follow the news. It’s not the right approach for everyone, but it does work for a lot of people that are passionate about keeping tabs on certain worldwide markets. And because oil is the biggest commodity in the world, there’s a lot of info out there on it.